The first was Procedural Hierarchy of Issues (PHI), first described in Ray McCall’s PhD Dissertation although not named at the time. The first Rationale Management System (RMS) was PROTOCOL, which supported PHI, which was followed by other PHI-based systems MIKROPOLIS and PHIDIAS. The first system providing IBIS support was Hans Dehlinger’s STIEC. Rittel developed a small system in 1983 (also not published) and the better known gIBIS (graphical IBIS) was developed in 1987. The “Record-and-replay” method simply captures rationales as they unfold. Rationales are synchronously captured in a video conference or asynchronously captured via bulletin board or email-based discussion. If the system has informal and semi-formal representation, the method will be helpful. The “Methodological byproduct” method captures rationales during the process of design following a schema. But it’s hard to design such a schema. The advantage of this method is its low cost. With a rich knowledge base(KB) created in advance, the “Apprentice” method captures rationales by asking questions when confusing or disagreeing with the designer’s action. This method benefits not only the user but the system. In “Automatic Generation” method, design rationales are automatically generated from an execution history at low cost. It has the ability in maintaining consistent and up-to-date rationales. But the cost of compiling the execution history is high due to the complexity and difficulty of some machine-learning problems. The “Historian” method let a person or computer program watches all designer's actions but does not make suggestions. Rationales are captured during the design process. Another important approach to argumentation of design rationale is Rittel and Kunz’s IBIS (Issue-Based Information System), which is actually not a software system but an argumentative notation. It has been implemented in software form by gIBIS (graphical IBIS), itIBIS (test-based IBIS), Compendium, and other software. IBIS uses some rationale elements (denoted as nodes) such as issues, positions, arguments, resolutions and several relationships such as more general than, logical successor to, temporal successor to, replaces and similar to, to link the issue discussions. PHI (Procedural Hierarchy of Issues) extended IBIS to noncontroversial issues and redefined the relationships. PHI adds the subissue relationship which means one issue’s resolution depends on the resolution of another issue. DR is used by research communities in software engineering, mechanical design, artificial intelligence, civil engineering, and human-computer interaction research. 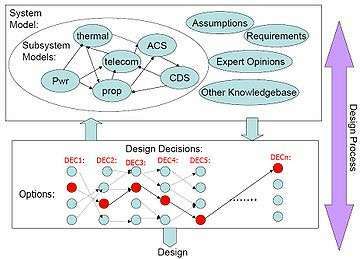 In software engineering, it could be used to support the designers ideas during requirement analysis, capturing and documenting design meetings and predicting possible issues due to new design approach. In software architecture and outcourcing solution design, it can justify the outcome of architectural decisions and serve as a design guide. In civil engineering, it helps to coordinate the variety of work that the designers do at the same time in different areas of a construction project. It also help the designers to understand and respect each other’s ideas and resolve any possible issues.